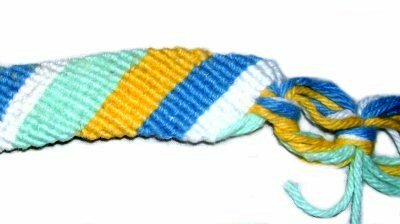 Description: This Friendship Bracelet has a ribbed appearance and features the Vertical Half Hitch. Be sure to make it with soft material, such as Cotton Crochet cord or yarn. 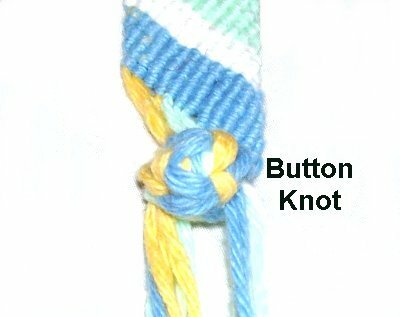 The knots will be tiny and will create a striped pattern if you use several different colors. The clasp is made with the Square Knot Button and a simple loop closure. 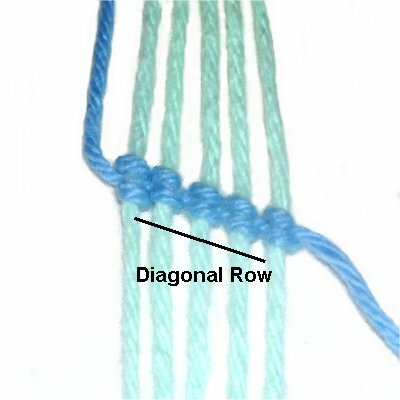 This Micro-Macrame project is time consuming, but easy to make. 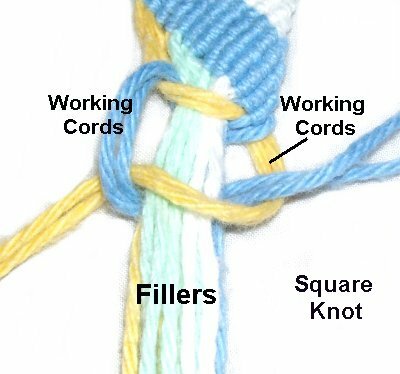 It's a good project for beginners who have some experience tying this type of knot. You will need at least 12 cords to make the Friendship Bracelet wide enough for most wrist sizes. In the example shown, a total of 14 cords of 1.5mm material was used, which made it almost 1-inch wide. 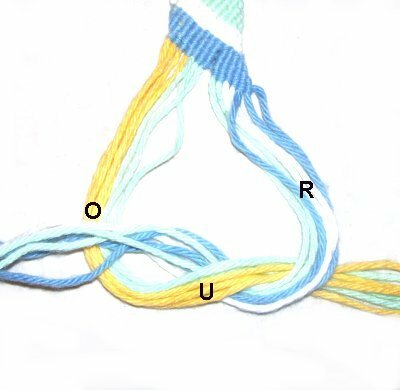 There were 2 white cords, 3 blue, 4 yellow, and 5 green. Varying the number of cords in each group will cause the stripes to change size. You can use as many cords as you wish, and arrange the colors in any way. The length of each cord should be 9 times the finished size you wish to make. So for a 7-inch size, each cord should be at least 63 inches. Prepare the ends by tying tight Overhand Knots at the tips of each cord. You could also use glue or tape to prepare them. Step 1: Separate the cords into groups of the same color. 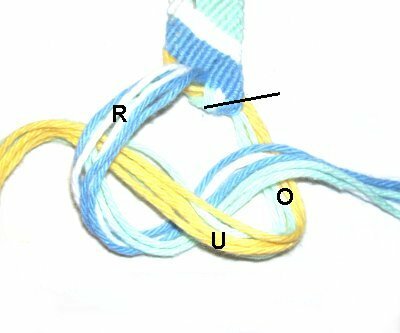 Tie a loose Overhand Knot 10 inches from one end, in one group. This knot is temporary, so you can secure the cords to your board more easily. Repeat with the other groups of cords. Step 2: The striped pattern is determined by the order in which you organize the cords. Secure them vertically on your project board, by placing a pin through the Overhand knot (or tape). Make sure they are not tangled. Important: The first row of Double Half Hitches determines the ANGLE of the stripes. Place a piece of tape just below the Overhand knots, and move it downward on the diagonal slant in which you want the stripes to form. Step 3: Use the first cord on the left as the working cord. Pass it under the cord next to it on the right, which will hold the knot. Bring it over - under the holding cord, moving clockwise. Make sure it passes over the working cord as you pull it to the right. Design Tip: It's important to tighten all the Half Hitches firmly, so the rows are neat and straight. The first row of knots will rest against the tape, on the angle you placed it. After the first row is tied, the tape can be removed, since the remaining rows will follow the angle of the first row. Step 4: Repeat step 3, tying the next knot in the same manner. 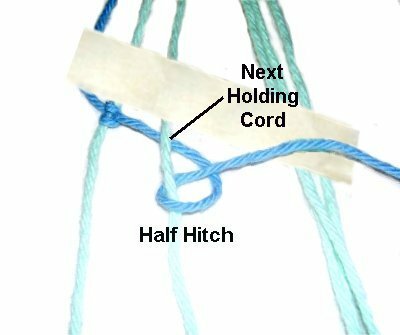 Steps 3 + 4 = one Vertical Half Hitch (VHH). Step 5: Tie the next VHH onto the next cord to the right. Make sure you use the same working cord. Tighten both Half Hitches firmly, so the knots on both holding cords will rest close together. Step 6: Complete the first row of the Friendship Bracelet by tying VHH onto all the remaining cords, progressing towards the right. Use the same working cord. Step 7: For the second row, use the cord that's now furthest to the left as the new working cord. It's the first cord you attached in step 3. Tie VHH onto all the other cords, including the first working cord, which is resting on the far right. Step 8: For the 3rd row, use the cord furthest to the left again, as the next working cord. Tie the VDHH unto all the other cords, including both of the previous working cords at the far right. Step 9: Repeat Steps 3 - 6 until the Friendship Bracelet is the finished size you need, minus 2 inches. Don't include the 10 inches above the Overhand knot. You still need to make the clasp, which is around 2 inches in size. So for an 8-inch bracelet, stop at 6 inches. Step 10: Untie the Overhand Knot you made in Step 1. Divide the cords at that end into two groups. 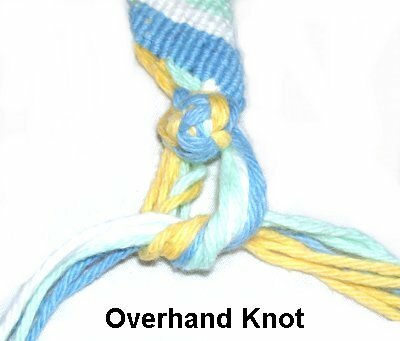 Tie a new Overhand knot by passing the right group under - over the left group as shown. Tighten the knot firmly, so it rests against the edge of the VHH. 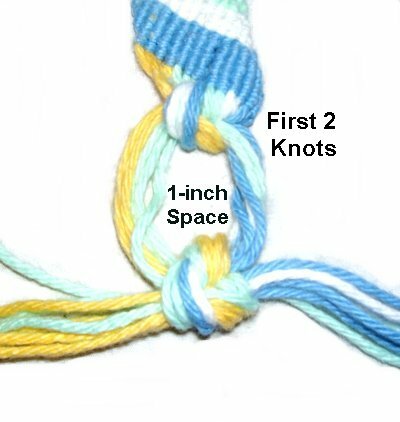 Tie another Overhand knot using the right group, which is now on the left. Pass it under - over the other group. 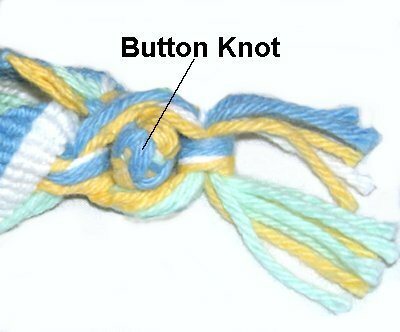 By creating the knots in different directions, it will look like a Square Knot. Design Tip: You can create a different type of clasp if you don't like the one chosen for this Friendship Bracelet. Step 11: Leave a 1-inch space, and then repeat step 10. The finishing process at this end will be completed in steps 15 - 16. 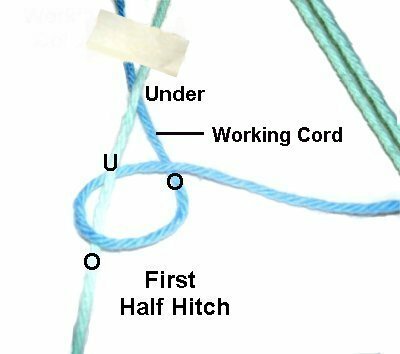 Step 12: At the opposite end of the Friendship Bracelet, tie one Square Knot using the first and last two cords to tie the knot. The remaining cords are the fillers. Tighten it so it rests just under the last row of VHH. 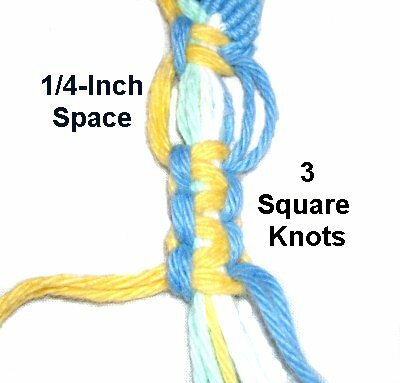 Leave a 1/4-inch space, and tie 2 more Square Knots (total of 3). Locate the areas on each side of the filler cords, which you can see in the center of the 1/4-inch space. Those spaces are important in the next step. Step 13: Divide the cords into two groups. Pull the ends of the left group through the area to the left of the fillers (inside the 1/4-inch space). Do the same with the ends of the right group, passing them through to the right of the fillers. Pull on the ends to roll the SK into the button shape. Step 14: Tie a very tight Overhand knot with the two groups, to secure the button. Try to position it behind the button. Apply glue inside the knot while tightening. 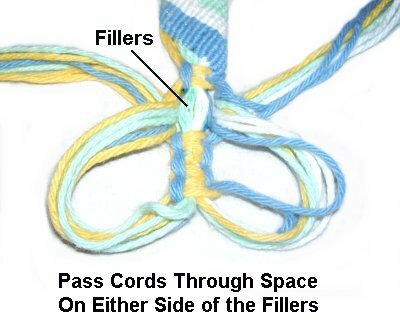 Finishing Option: You can divide the cords into smaller groups and tie several smaller knots rather than one large knot. Step 15: Adjust the size of the clasp as needed (step 11), so the opening is large enough for the button knot to fit through easily. 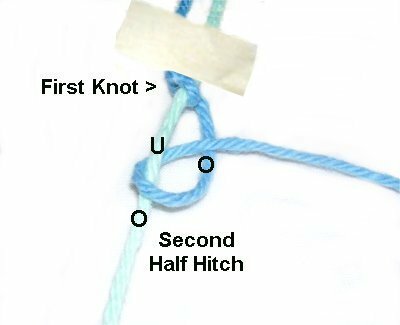 Just untie the second Overhand knot to change the size of the opening. Step 16: Once the adjustments are made, apply glue inside the Overhand knot as you tighten it firmly. Trim the ends so they are even, forming a fringe at both ends of the Friendship Bracelet. Have any comments about the Friendship Bracelet? Contact Me.